By now, there's a certain comfy formula to dystopian young-adult literature. The world is wrong, the past's a ruin, and only attractive teenagers can see the truth. Catherine Fischer's Incarceron fit this pattern neatly, but her sequel delivers something new. Reading the sequel, Sapphique, made me raise my opinion of Incarceron a lot, and together, the two novels form a really neat duology. 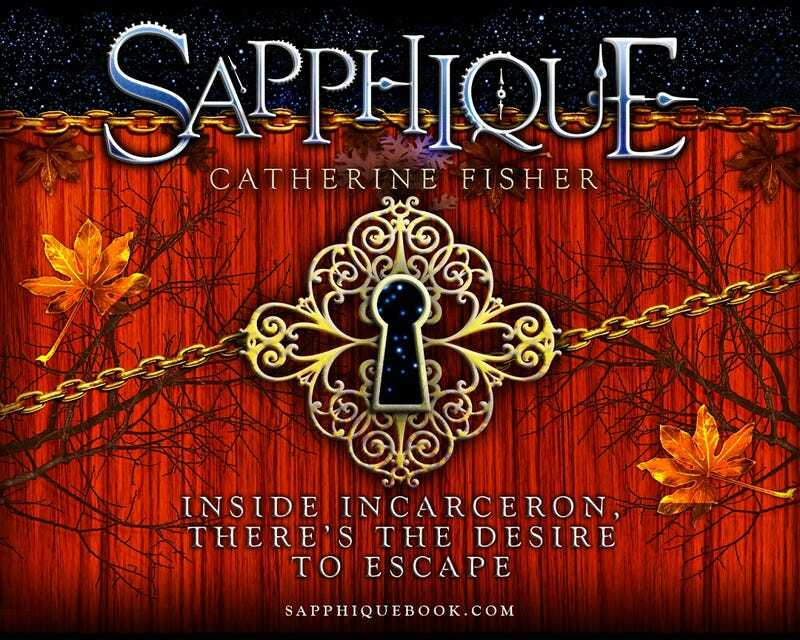 A lot of the stuff that felt a bit clunky in Incarceron makes a lot more sense in Sapphique, and the two books would be great to read back-to-back. It's sort of a cliché to say that the setting is a main character, especially when you're talking about a dystopian world with a lot of intricate world-building. But it's especially true in the case of Incarceron/Sapphique, where the two worlds — the Realm and the prison — steal the limelight. And the prison itself becomes one of the most fascinating characters in the book. All over Incarceron, through its tunnels and corridors, its cells and seas, the Eyes began to close. One by one, they rippled off down galleries where people came out of their huts to stare; in cities where priests of obscure cults cried out to Sapphique; in remote halls where nomads had wandered for centuries; above a crazed Prisoner digging his lifelong tunnel with a rusty spade. The Eyes went out in ceilings, in the cobwebbed corner of a cell, in the den of a Winglord, in the thatched eaves of a cottage. Incarceron withdrew its gaze, and for the first time since its waking the Prison ignored its Inmates, drew in on itself, closed down empty sections, gathered its great strength. It feels like a really well-realized world, with the prison's consciousness a constant, creepy presence throughout. Especially in the second book, you discover all the ways that Incarceron, the sentient prison, has gone insane. Long ago, the people of the Realm created Incarceron to be a paradise, and stuck all of their undesirable people in there. But over the centuries, Incarceron has become a hellhole, and the artificially intelligent prison has gotten crueler and more twisted. Meanwhile, the legend of Sapphique, the nine-fingered sage who escaped from Incarceron and gained enlightenment in the process, has become the main religion Inside. The other world we saw in Incarceron was the Realm, a different sort of failed utopia where everybody is required by law to live in a kind of fake 18th century, with a Protocol governing exactly how people can live. All of the Realm's residents seem aware of the existence of high technology, but they stick to candles and horses. In this gilded cage lives Claudia, the daughter of Incarceron's Warden, who is promised in marriage to the boorish Prince Caspar and is nothing more than one of her father's pawns. In the second book, Claudia teams up with Finn, a man who's escaped from the prison and who appears to be the rightful heir to the throne of the Realm. But Finn is deeply damaged by his time inside the prison, and seems incapable of navigating the harsh but cultured world of court society. Meanwhile, Finn's friends who are still trapped inside the prison try to find their own way out, while discovering that the prison has plans of its own. I think one reason why the Incarceron/Sapphique duology seems a lot better after reading the second book is because the metaphors about prisons and escape become way more interesting in the second half of the story. In this sort of story, you sort of expect a fairly explicit comparison between the two types of imprisonment — that of the people inside Incarceron, who are living in squalor and many of whom are cyborgs reconstructed by the prison out of organic and metal parts, and that of Claudia and the others in the luxurious Realm, where their freedom is just as constrained. You sort of expect to discover that both worlds are equally unfree. Like, man, it's all a prison. But in Sapphique, the connections between Incarceron and the Realm become a lot more intricate and fascinating, and we learn that neither place is entirely what it seems. If the first book was about setting up dualities, the second book is about breaking them down, and showing that oppositions are never as neat as they first appear. There are tons of doublings in the second book, and many of them turn out to be either illusions or false dichotomies. Even the separation between Sapphique, the sage who escaped, and Incarceron, the prison he escaped from, emerges as something much muddier — and it doesn't entirely come as a surprise when we discover that the prison wants to escape from itself. And "escaping from yourself" becomes a metaphor that means different things to different people in the story — whether it means transcending the limitations of your physical body, or getting away from the life choices that have trapped you. The second book is full of people who want to escape from themselves, just like Incarceron does. As Sapphique, the sage who escaped, says when we finally meet him in a vision, "Escape is not enough; it does not answer the questions. It is not Freedom." More than just getting out of a small prison into a larger one, freedom means finding your true self. Escapism and finding yourself, of course, are common themes in YA literature, but by the end of Sapphique, you see them examined in some imaginative ways that you've probably never seen before. Both Incarceron and the Realm are failed social experiments, and they're both sustained by illusion, which is why a mythical sage and a stage magician provide the conduits to discovering the reality behind them. But they're also both intertwined parts of the prison-industrial complex of this weird future dystopia, and in the end Fischer seems to suggest that utopian ventures that depend on both coercion and deception are doomed to fail — and to taint the society that spawned them. As far as the actual plot of Sapphique goes, I sort of want to avoid giving away too much, in case you haven't read the first book. Suffice to say, there's a struggle for control over the Realm, and a pretender to the throne, and meanwhile the sentient prison is making plans of its own. Part of the cleverness of these books is that you can read them as high fantasy — as other reviews have pointed out, there's a wicked stepmother, objects of power, and sundry enchantments — or as dystopian science fiction. The biggest problem with the second book, though, is the human characters — more than in the first book, you sense that there's nobody really terribly likable in this story, except maybe for Claudia's tutor Jared. The characters mostly don't seem to like each other that much, even when they're on the same side. And unusually for this sort of book, Fischer doesn't make that much effort to provide a credible love story. It seems sort of fitting for a story about imprisonment and what it costs us, to avoid giving us the luxury of warmth or emotional connections among the people in the story. So after reading both books, it's clear that the Incarceron/Sapphique saga isn't proof that the field of YA science fiction is getting clichéd and stale, as I'd feared — in fact, these books prove, more than ever, that YA fiction is where some of the most daring, imaginative writing about ideas is happening these days. Definitely worth checking out.